One of our favorite things about living in Citrus County is that there is an endless number of things to see and do. There is always something happening right here in the Villages of Citrus Hills, and there are just as many fun attractions throughout the rest of the county. All of these attractions and activities are great for those of us who call Citrus County home, but they can be a little overwhelming for those who are just visiting with us for a short time. 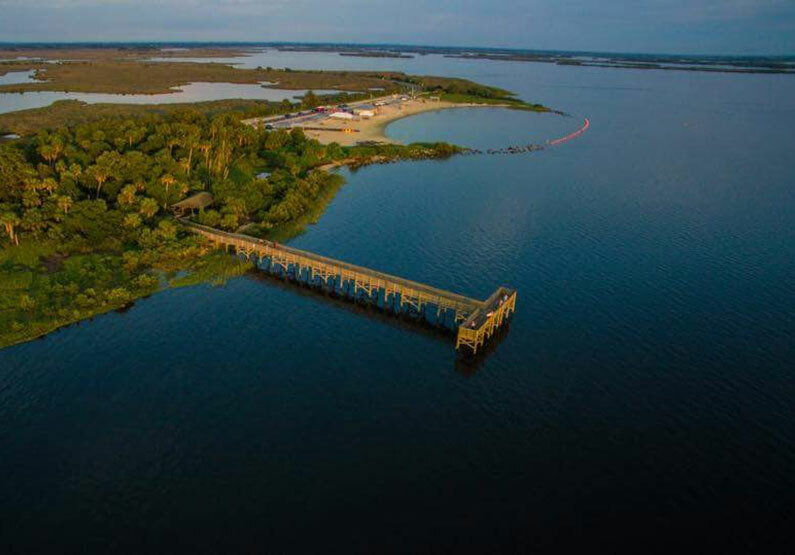 For that reason, we thought it would be a good idea to put together a list of the top five places everyone must see while visiting in Citrus County. Fort Island Gulf Beach is one of those places that you probably say, “We should come here more often,” just about every time you visit. It has beautiful white sand beaches, public restrooms, and a great boardwalk overlooking the water. When your guests visit the Gulf Coast of Florida, they are definitely going to want to SEE the Gulf Coast. This is the perfect way for them to see it right here in Citrus County, and it’s also an extremely relaxing way to spend a day. Bicycling is a fun way to show your guests a good time outdoors, making the most of our great Florida weather. 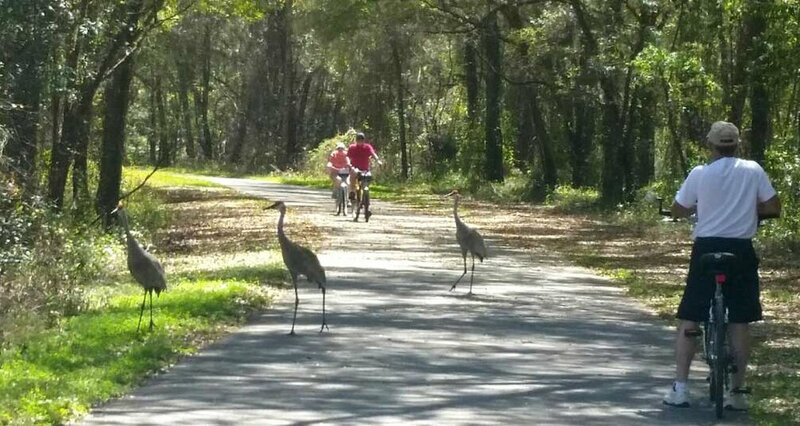 There are lots of trails to choose from around Citrus County, but the Withlacoochee State Trail is the one that is a must-see attraction. This is a perfect place for cyclists of all skill levels. You can take your time and cruise just a few miles, or push the envelope and explore all 46 miles of former train tracks. If your visitors are looking for something a little more adventurous that is still a great representation of life in Citrus County, taking them tubing on the Rainbow River is a perfect way to spend an afternoon. Tubing is popular from the beginning of April through the end of September and is the kind of experience that your visitors will be sure to tell everyone back home about! Whether your guests are interested in history, shopping, or great food, there is something for everyone to enjoy just a few miles away in downtown Inverness. Every tour of Inverness should start at the Old Courthouse Heritage Museum, but you might also want to explore the local shopping or grab some takeout food and head to Fort Cooper State Park for a picnic lunch. A lot of people who visit Florida want to get to the beach, which we addressed with number five on this list. But the main interest for many who visit Citrus County specifically is to see live manatees, and the best place to do that is Homosassa Springs Wildlife State Park! Visitors can get up close and personal with live manatees from the underwater observatory. They can also learn a lot more about these local mammals from the information sessions held regularly at the park. Among each of these five attractions, you will definitely show your guests some of the very best highlights of Citrus County. And if you haven’t been to all of these places yourself, what are you waiting for? Are You Ready for This Year’s Scalloping Season? Throughout most of the country, the weeks leading up to the Fourth of July are filled with fireworks and cookouts. But here along the Gulf Coast, we’re also focused on one of our favorite seafood items: SCALLOPS! That’s right! Scalloping season is right around the corner. This year, the season kicks off on Sunday, July 1 and runs all the way through Monday, September 24. And whether you enjoy eating scallops or not, spending a day catching them is one of the most exciting things you can do in Citrus County. If you are planning on heading out on your own scalloping adventure this year, you will want to be aware of the rules and regulations that you are going to be expected to follow. First and foremost, anyone out scalloping on their own must obtain a Florida Saltwater Fishing License. In addition to having a license, there is a limit to how many scallops you are allowed to harvest on any given day. Just as it has been in previous years, the limit in 2018 is two gallons of whole scallops or one pint of scallop meat per person. There is also a maximum of 10 gallons permitted for each vessel out in the water. On top of that, the vessel you are using to scallop must leave from and return to a dock that is located within an area where scalloping is permitted. If all of those rules and regulations are making your head spin, you are not alone. Luckily, there is another option. By scheduling a private scalloping charter with one of the many tour companies throughout Citrus County, you can enjoy harvesting your scallops without having to worry about remembering the rules. When you go scalloping with a reputable charter company, you will be provided with all the gear and licenses you need, plus a guide who knows all of the details about how much you can harvest. After spending a fun afternoon out in the water grabbing scallops and shoving them into your mesh bag, the next step is to get them ready for dinner. But don’t worry, that process isn’t nearly as difficult as you might think. If you have the benefit of being on a scalloping charter, there is a good chance that shucking your scallops is included in the price. If not, get out your knife and dig in! Here is a great video that breaks down the process for you. Once you get your scallops shucked and cleaned, it’s time to figure out how to cook them! The most common way to prepare scallops is to pan fry them on each side for about a minute. Keep in mind that you are more likely to overcook them than to undercook them. So don’t panic! While most people prefer their scallops fried in butter with a bit of their favorite seasoning, this article from Coastal Living Magazine offers up 25 unique recipes for anyone who is looking for something a bit different. The Scallop-Spinach Spread and the Scallop and Avocado Tostadas sound delicious. No matter how you like your scallops prepared, there is no denying that spending a day out on the boat harvesting them is one of the biggest benefits to living along The Nature Coast. without filling a few mesh bags of your own! and some of the popular local scallop charter companies. This year, scallop season kicks off on July 1 and runs through September 24. If you are an experienced scallop hunter, that is pretty much all you need to know. But if you are new to this kind of adventure, or would like to improve your game, we have put together a few tips and tricks that will help you impress your fellow scallopers over the course of the summer. The first trick to being a great scallop hunter is knowing exactly what the rules and regulations are when you are out collecting these delicious shellfish. First and foremost, you must obtain a Florida Saltwater Fishing License prior to collecting any scallops, unless you go scalloping with one of our local fishing charter companies. You also need to be aware that there is a daily limit on how many scallops you can collect. This year's scallopers are restricted to only two gallons of scallops in their shells, or one pint of actual scallop meat. There is no restriction on the size of the scallops, but the limits on volume are very precise. Most commercial tools are not permitted for recreational scalloping. The preferred container for most scallop hunters is a simple mesh bag, which you can find at a number of different retailers throughout Citrus County. You will also want to have diving equipment that you are comfortable working with in shallow waters. If you don't have your own equipment, you might consider signing up for a scallop excursion with one of the local charter companies that provide all of the equipment you will need. If you have the benefit of heading out with a local charter company, you will likely be working with an experienced guide who will take you right to the best scallop locations. However, if you are working on your own, you should know that scallops prefer to make their homes in grassy areas that range from four to eight feet of water. Whether you are navigating a boat or diving yourself, you should always be alert to diving flags. These are your best clue to avoid running into other divers in more ways than one. In addition to dive flags, you should also make every effort to practice diving prior to heading out looking for scallops. Diving gear can take some time to get used to, and you don't want to waste any time on your scalloping adventure figuring out how to best fit your new mask. If you are going scalloping on your own, you are going to have to shuck them yourself. This is not difficult once you learn how, but learning can be a difficult task if you don't have the right teacher. Spend a few minutes before your trip refreshing yourself on the basics so that you don't end up with a big bag of scallops and no clue how to shuck them. Once again, if you are heading out with a charter tour, your guide will likely take care of the shucking for you. But it never hurts to have a little background information before you hit the water! No matter how much scalloping you plan to do this summer, having a solid base of knowledge before you start will make the entire experience more enjoyable. Once you have the basics down, the only thing left is to learn how to make a good seasoning and locating a great cast iron skillet to cook the day’s haul! There’s no place like home here at the Villages of Citrus Hills, but it’s nice to get away every now and then, and when the time comes there is nothing quite like a getaway to the Florida Keys. While we have already covered all kinds of great places to stay, things to do, and outstanding restaurants in Key Largo and Key West, there are also dozens of spots in between those destinations that also make for a great weekend getaway. So, let's explore the Upper and Middle Keys. Islamorada is one of the most popular places to stop for many tourists making the journey from the mainland all the way down to Key West, but it is also a destination in and of itself. Here you will find the Postcard Inn Beach Resort & Marina, which offers every bit of the paradise you would imagine exists in the Keys. With all of the resort amenities offered at the Postcard, this is a one-stop shop for a weekend getaway. If you are looking for a more secluded getaway, Duck Key could be the perfect destination for you. The place to stay here is the Hawks Cay Resort, which offers standard hotel-style rooms, as well as more private villas. If being as close to the beach as possible is important to you, then the Rainbow Bend Fishing Resort in Marathon should be on your short list. This is also the place to stay if you are looking to spend the weekend fishing, which is one of the many ways to enjoy yourself in the Keys. Craft beer lovers will be thrilled to know that there are two different breweries located right in Islamorada. Both the Florida Keys Brewery and the Islamorada Beer Company Brewery and Tasting Room offer up a fantastic selection of local beer in a traditional Florida Keys atmosphere. Another fun way to spend a weekend in the Keys is to get right into the water. In Duck Key, you will find swimming with dolphins, scuba diving, and chartering your own fishing expedition. No matter what you are looking to do on the water, there are plenty of choices in the Keys. One of the most popular tourist attractions in Marathon for animal lovers is The Turtle Hospital. They have been rehabbing injured sea turtles and educating the public about them since 1986, and it is consistently recommended among the top places for animal enthusiasts to visit in all of the Keys. When you are heading out to eat in the Keys, the atmosphere is almost as important as the food. One of the best places to find that environment in Islamorada is the Islamorada Fish Company, where you will find a massive outdoor restaurant with a menu full of great seafood. We recommend trying the Grouper Reuben! Whether you are staying there or not, the place to eat in Duck Key is Alma, which is located on the property at Hawks Cay Resort. This high-end restaurant divides its menu evenly between local seafood dishes and excellent cuts of meat, and everything is delicious. In addition to all of the excellent seafood, you will also find plenty of Cuban restaurants throughout the Keys. One of our favorite spots is La Nina Restaurant in Marathon. It might not look like much from the outside, but this little restaurant will blow you away with their Cuban pork and beef dishes. You can find ways to spend an entire weekend exploring any single town in the Upper and Middle Keys. You can also have a blast cruising from key to key in search of specific destinations. Whatever your idea of a great weekend might be, you can make it a reality in the Florida Keys. There are dozens of reasons why Florida is a great place to live, but one of the top reasons has to be that the weather is nice and warm during the winter months. Many of our friends and neighbors here in the Villages of Citrus Hills go north for the summer only to come running back at the first sign of winter. Ironically, our local manatee population demonstrates the exact same behavior! West Indian Manatees are extremely popular animals in Citrus County due to our year round population of them, which gets especially large during the winter months. Despite their enormous size, these sea mammals have relatively little body fat and require warm water in order to survive. For that reason, they tend to migrate to the warm spring waters such as Crystal River and Homosassa Springs during the winter months. Another way that manatees are similar to our snowbird friends and neighbors is that once they find a place they like, they will return to the same spot year after year. It is not uncommon for a mother and her calf to go their separate ways out at sea for the entire summer and then be spotted hanging out together in their usual winter habitat the following year. As the manatees begin to migrate back towards our local springs for the winter, now is a great time to be planning your next manatee encounter. Whether you are looking to swim alongside the manatees, kayak near them, or observe them from dry land, there are great places to do all of those in Crystal River and Homosassa Springs! The best places to see manatees in the Crystal River area are Three Sisters Springs and the Kings Bay Manatee Sanctuary. Both of these places are best accessed by boat, but you can only get so close. In order to get up close and personal you will have to be in a kayak or canoe. There are also a number of tour companies that operate out of the Crystal River area that specialize in manatee tours. These companies can take you right up to the popular manatee areas and many will instruct you on swimming right along with the manatees! If you are looking to learn more about manatees, Ellie Schiller Homosassa Springs Wildlife State Park is the best place in the region. There is a daily educational program that gives visitors some background on manatees including their history and the rehabilitation efforts that are conducted at the park. The Ellie Schiller Homosassa Springs Wildlife State Park also has what they call the “Fish Bowl,” which is an underwater viewing area similar to what you would expect to find at an aquarium. This gives visitors the chance to get up close and personal with manatees without even getting wet! Because manatees are attracted to warm waters, they also tend to be attracted to power plants. One really interesting place to observe them is from the Tampa Electric Company near the mouth of the Hillsborough River. The warm water that the power plant discharges into the river is like a magnet for manatees, and the company has built a visitor center, overlook, and walkway for visitors to observe this phenomenon. Whether you prefer to break out your kayak and meet the manatees in their natural environment in Crystal River or stay on dry land and observe them from a distance at Homosassa Springs or the Tampa Electric Company power plant, make sure you take some time to get out and see these amazing sea mammals near the Villages of Citrus Hills this winter. If you are looking for a tour company to take you and a group of friends out swimming with manatees or on a scalloping adventure, you are probably going to start your search using a website like Yelp or TripAdvisor. Because those types of sites tend to attract people who are looking to complain more often than complement, we have all learned over the years that we have to take negative reviews with a grain of salt. But what if there was a company that had hardly any negative reviews? Wouldn’t that be the one you wanted to hire? Bird’s Underwater in Crystal River is that company! At the time of this writing, they are rated 5 stars on both Yelp and TripAdvisor with virtually no negative reviews. In today’s eager-to-complain environment, that is really something special! Bird’s Underwater Dive Center is located right on Kings Bay in Crystal River. Bill “Bird” Oestreich and his wife Diane started it back in 1989. They have since grown the business to include a number of certified and insured “captains” that lead all kinds of tours, training classes, and other adventures. In addition to being popular among local residents and regular vacationers, Bird’s Underwater has also been featured on TV shows like Small Planet, Mutual of Omaha’s Wild Kingdom, Lonely Planet, and The 700 Club. “I can't say enough good things about our trip." Scalloping with Bird's Underwater was an amazing experience. On our drive home we had already decided we will be making a yearly trip from Daytona to Crystal River to go scalloping with Bird's Underwater. Swimming with manatees is probably the most sought after experience in the Crystal River area, and nobody delivers on that experience quite like Bird’s Underwater. They have tours leaving daily that seat anywhere from 6-11 passengers. You can also book private tours for parties of 6. During scalloping season, another popular option is to head out on a Bird’s Underwater charter so that you can catch your fill of scallops without having to worry about getting a fishing license or bringing any equipment. Bird’s Underwater takes care of everything for you. Manatee tours can be booked right from their website, and scalloping tours can be booked over the phone during scalloping season. On top of delivering amazing tour experience, Bird’s Underwater is also your one-stop shop for all things diving in Crystal River. Never been scuba diving before? That’s no problem, because Bill “Bird” Ostreich himself teaches regular dive classes right at the facility. With dive experience dating back to the early 1970s, Bird is a wealth of information and an excellent teacher. Bird’s Underwater also offers guided dives that will allow you to experience some of the best dive spots in Citrus County with a local expert guiding you through to all of the best underwater spots. If you are tired of hearing about places like Blue Grotto and Devil’s Den and are ready to see them for yourself, this is a great way to get there! As for any diving equipment needs, Bird’s is a Scubapro Platinum Dealer and an authorized Scubapro Service Center. So if you are already an experienced diver, they can fix you up with the best of the best equipment and make sure it is always in tip-top shape. If you are looking to really take your Bird’s Underwater experience to the next level, you might want to consider booking one of their two rental properties to stay at during one of their multiple day dive tours. One of the houses is located right on the Homosassa River, and the other is on the Halls River. Both of the Bird’s rental houses come with kayaks, TV and internet, and fully equipped kitchens. No matter what your level of experience, Bird’s Underwater has an amazing adventure that is perfect for you. So the next time you find yourself thinking about manatees, scallops, or scuba diving, stop thinking about it and book a tour with Bird’s. According to the hundreds of satisfied customers on Yelp and TripAdvisor, you will not be disappointed.